In 2014, now-ex-sports car racing figures Gregory Loles and Henry Zogaib were sentenced within one day of each other for scamming people out of millions of dollars in their own separate Ponzi schemes, per an incredible article on Road & Track. Loles’ story was scandalous enough to recently make it onto a recent episode of CNBC’s American Greed. Loles, who co-owned the Farnbacher Loles team, stole from the St. Barbara’s Greek Orthodox Church and its congregation in Danbury, Connecticut—$27 million from 250 people in total, per Road & Track. Loles funded an extravagant lifestyle, high-class travel, the Farnbacher Loles racing team and even a massive car servicing center in Danbury. Races were a black hole for money, too. Running just one car for a year costs anywhere from $800,000 to $1 million dollars. Race winnings were a mere fraction of that figure. These race car guys get addicted and they just start throwing millions and millions of dollars, so I’ve seen this all my life. You know, they talk about drug users selling jewelry. I could tell you hundreds of stories about people selling kitchen appliances to pay for a set of tires. And thus, the motivation for a notorious Ponzi scheme is born. Cox and the others close to Loles couldn’t unravel it until it all came out that Loles was taking money he promised to invest and spending it on his own and his team’s expenses. You can watch the full episode here, if you have a cable TV login, with the full, ludicrous story of Loles blowing away peoples’ life savings and retirement funds on race cars. Stealing from people of God is bad enough, but Zogaib stole from people he shared a paddock with. 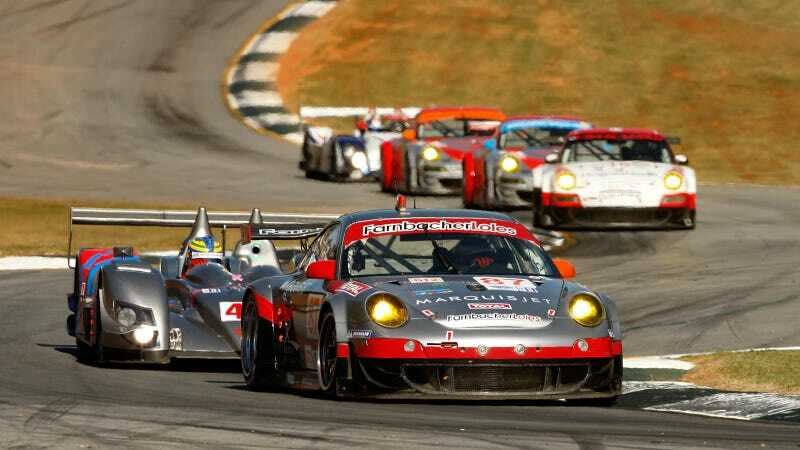 Zogaib was both a driver and the team financier for the SAMAX Grand-Am team in 2008, where he stole $800,000 from team owner Peter Baron as well as $550,000 from co-driver Ryan Dalziel and his father under the guise that Zogaib would invest the cash. I remember doing a race where it barely covered the price of my flight to get there and it was a [Grand-Am] Daytona Prototype race where I podiumed, and this was in 2009. And by the time I paid my expenses I don’t think I even made $1,000. You go to that point where a thousand dollars was the difference between making your rent that month or not. You should read the rest of Dalziel’s interview about the incident on Road & Track here, because it’s incredible the toll these kinds of scams even took on relatively well-to-do racing families. It’s certainly worth getting punched in the face, at the very least. Race cars are fun but expensive, kids! Don’t fund your rides with other peoples’ money, or you’ll end up behind bars like these two. Loles was sentenced for 25-years in Connecticut, and Zogaib is serving out a 15-year sentence in Florida.